By the time I walked from Virage Porsche to Maison Blanche, night had fallen, and the track and car lights were a “blaze”. 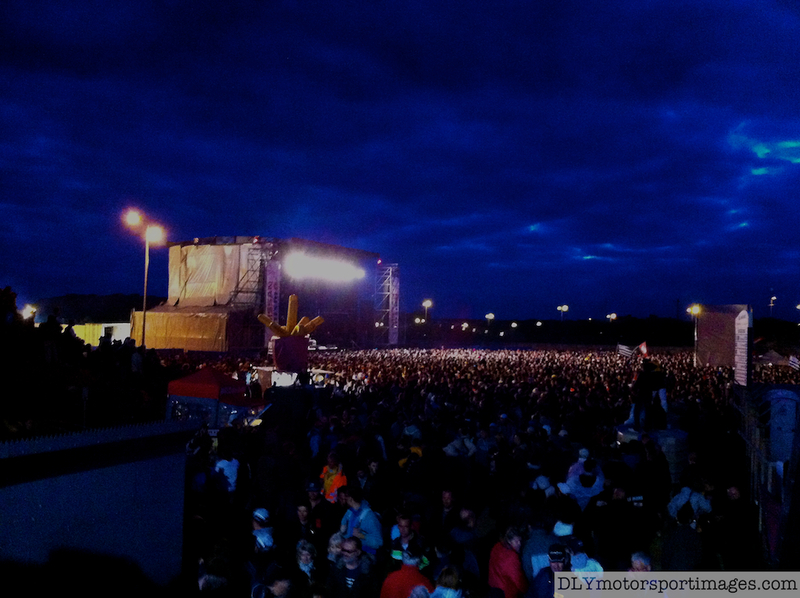 Seeing and experiencing Le Mans at night is an amazing experience that can’t be described in words. Hope you like the photos.I walked past the Ferris Wheel and re-entered the track at Maison Blanche. Then worked my way up the track, visiting the front straight grandstands, crossing over to the inside track paddock, past the Audi Fan Area, then back to the outside of the track via the Dunlop Bridge and the tens of thousands of people at the concert watching “Earth Wind and Fire” (at 11 pm Saturday night), and down The Esses to the inside part of the track at Tertre Rouge. The walk from Virage Porsche to Tertre Rouge must have taken a couple of hours. Got to Tertre Rouge around 11.30 pm Saturday night. At night you can see the brake drums of some of the cars (especially the Porsches) glow red hot as they brake into the Tertre Rouge corner. Unfortunately, the catch fencing and hundreds of spectators prevented me getting clear shots of the cars braking into the Tertre Rouge corner from inside the track. However, I managed to get a couple of good shots as the cars were going around the Tertre Rouge corner. The track lighting at Tertre Rouge lights the side of the car facing the outside of the track. Hence, from inside the track you have to rely on the trailing car to light the leading car. Using this lighting strategy, I was able to shoot the leading car using an ISO up to 3200, which I find is the limit for capturing shots at night with noise that is manageable (even with the 5DIII). I used Manual exposure and set the aperture on the 300mm lens wide open to f/2.8 and panned at a shutter speed of 1/100 to 1/200th of a second using AI servo. I must admit, panning the cars as they speed around Tertre Rouge at night was very hard for me. It took many attempts to get the right lighting on the leading car and proper focus on the part of the car I wanted focused (the car number). To add to these technical challenges, it was early Sunday morning and cold, which added to my physical exhaustion. Regardless, I kept at it and kept taking “one more shot” until I got the photos I was after, and said to myself “this is what I live for”. Left Tertre Rouge around 1 am Sunday morning, walked through the track underpass, then up the hill on the outside of the track to The Esses. Spent about an hour at The Esses to get shots of the cars coming down the hill with the leading car being silhouetted by the lights from the trailing cars. To avoid underexposure due to the cars front headlights, I set the ISO to 3200 and shot using Manual exposure with an aperture of f/4 and shutter speed of 1/800. To get these exposure settings I experimented with different shutter speeds. Towards the end of the photo shoot, it started to rain, so I covered my 5DIII and 300mm lens with an OpTech Rain Cover and kept shooting. In retrospect, I should have packed up my gear, since my trousers got very wet, and with the cold, made it a long walk back to the Grandstands. Left The Esses around 2.30 am when the rain started to get too heavy and found shelter in the Dunlop Grandstand where I stayed for about 30 minutes to rest and dry off a bit. I left the Dunlop Grandstand around 3 am and walked down the hill to the ACO Stand 18 where I got some food and coffee, and rest.